Lau holding his autobiography — Beyond Entrepreneurship, I Did It My Way. 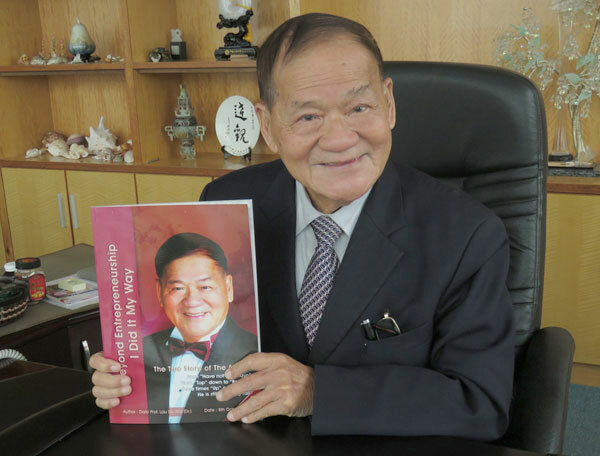 WHATEVER skeptics said could not be done, Dato’ Prof (Dr) Lau Siu Wai has gone out and proven them wrong — and in the process, made many dreams to own a house and obtain an education a reality. 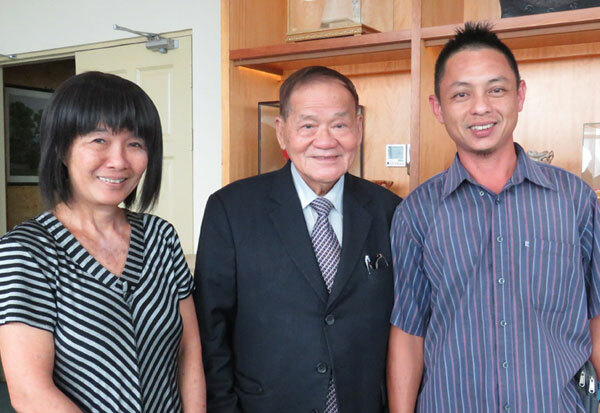 The 87-year-old housing developer also put Miri on the global education map by developing Curtin Sarawak University in the Division. In 1964, he set up Miri Secondary School to accommodate dropouts and in 1998, took the initiative to persuade Curtin to come to Miri. “Believe it or not, I got the vice chancellor of Curtin University to agree to have a campus here in just two meetings,” he said. On a trip to Perth in February 1998, Lau cajoled a friend into taking him to Curtin University’s Bentley campus but he did not make an appointment to see the people in charge. Eventually, he found someone from the University to fix one for him to talk with the vice chancellor. Lau answered the main reason was that Curtin produced graduates of impressive quality and he knew this because his son and daughter graduated from Curtin. He said there was a very large Asian population at Curtin — which meant the University could understand Asian students well. Lau also said education was in his blood and the main purpose of setting up a Curtin campus in Miri was not profit-oriented but to give deserving students an opportunity for quality education. The vice chancellor knew Lau meant well and expressed interest in studying his proposal. Two months later, the University sent three professors to Miri to research the viability of the project. An agreement was then signed with Datuk Patinggi Tan Sri Dr George Chan and witnessed by the current Head of State Tun Pehin Sri Abdul Taib Mahmud on May 16, 1998. A ceremony to extend a Letter of Invitation from the Malaysian government to Curtin University of Technology was held in Kuala Lumpur on Dec 4, 1998. After that, the first ever licence (No. 0001) was issued by the Education Ministry to set up and run a university campus in Miri. 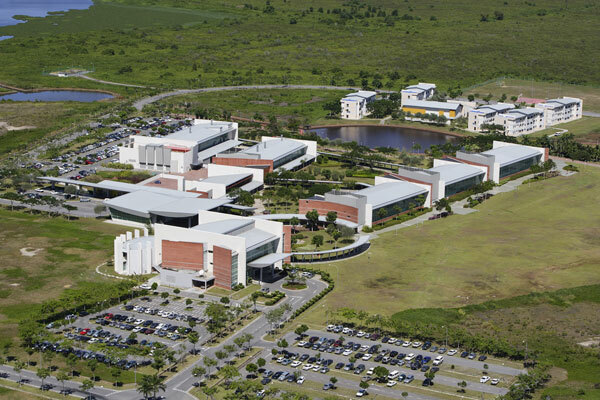 The first semester of Curtin University Sarawak started on Dec 22, 1998, at a temporary campus. Before the board of management was formed, all matters on the establishment of the university was handled by the Implementation Committee. In an interview recently, thesundaypost asked Lau when he initiated the Curtin University Sarawak project, did it ever occur to him that Curtin would be what it is today? Lau said he actually expected Curtin to grow much faster, adding that the present number about 4,000 students should have been attained 10 years ago. He pointed out that he was not in the Curtin Council and, therefore, couldn’t to do anything or share his views. According to him, the recruitment of students was not really ideal and growth would have been much faster had he been in the recruitment committee. Lau also said although he is not in the committee, he is prepared to help where possible. 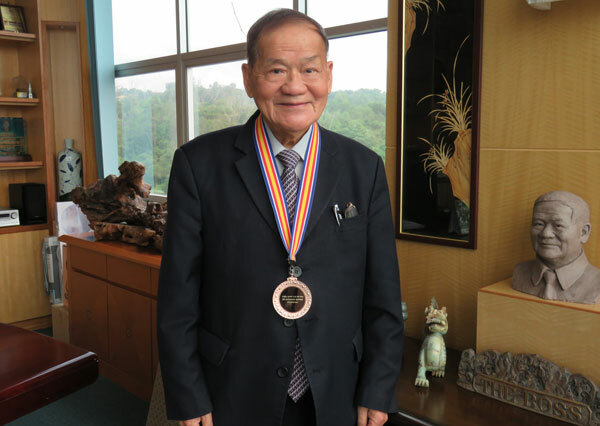 Lau with his IEM honorary member medal. Subsequently, in Q and A interview, thesundaypost, noting Lau has built over 15,000 houses throughout his career to help to boost home ownership in Miri, asked what gave him the most satisfaction in business? A: I have my most satisfying moment not in business but in what I have done. When I drive around Senadin area and see children of all races playing together as neighbours, I get a deep sense of satisfaction because right from the beginning, I have always wanted Sarawakians from different racial backgrounds to live harmoniously from an early age. This is the greatest satisfaction I ever have. It’s not about the number of houses I built or the projects I completed but the fact that promoting racial harmony and peace is my original idea, and seeing it crystalised is the most fulfilling feeling for me. How do you conduct market research, and find locations for your projects? I took a two per cent birthrate of the population — from there I worked out how many houses should be built in a year. If it were up to me, all the houses built would be occupied but I have no control over it — so people keep on building and now we can see more houses than required. For me, I usually develop based on the growth population which is about two per cent per annum but now the development is not based on that. Mostly, housing developers will build near or in the town because they can get buyers and make profit easier. For me, it’s different. For example, previously, I developed Piasau Garden, and now, Senadin as new settlement area so that the town itself will not be so congested. I chose the location with potential population growth and diversified the density from town to the outside area. I usually developed locations where people thought was not possible. I believe useless land can be developed to become useful. Meritz Hotel Lau built and owns. 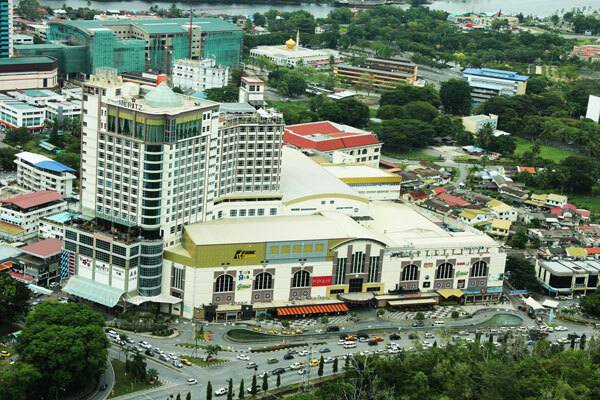 At right is Bintang Plaza shopping complex that he built. The site for the building used to be occupied by Miri Secondary School before it was closed in 1990. In your view as a developer, how important is it to master the art of persuasion? Very important because when you want to develop a place, there are bound to be all sorts of people who object. For example, when I developed Hilltop Garden, I came across one area that happened to be owned by two families. One family agreed to the project but the other owner, an old widow, loved her husband so much that she didn’t want anyone to touch her land even after I offered her a very high price. So that meant if I developed the land, I had to build a retaining wall to separate the area which was very costly. She couldn’t visualise how the land would look like after development. She usually left the house at 6am to sell vegetables. I had four Caterpillar tractors (D8C) standing by at the place and took the opportunity to cut down the hill. When she came home, she was furious and with a club in hand, rushed up the hill where I was supervising my tractors. I went down, met her half way and held her tightly so that she could not use the club to hit me. I apologised and brought her to sit down under the tree. I kept apologising and eventually she opened up to me when I mentioned her late husband. I kept talking to her about her happy days with her late husband and listened to her patiently although I couldn’t really understand her as she was talking in Hainam and I’m Teochew. As we were talking, my bulldozers were working as well. I then brought her to see her land and she was so surprised and thanked me for clearing it for her. As a developer, you will face problems if you do not master the art of persuasion. Do you think Miri’s development is on the right track? Are we behind in any way or do you think we need to change the way we do things in order to move forward? Yes, we are on the right track but things can happen beyond anybody’s control like the price of oil and gas. Development of Miri started with crude oil and natural gas before logging and plantation. The oil and gas belong to us and we need to be sharp to acquire what’s ours. In fact, we should emphasise more on development of tourism and education. I’m very interested in education because I see a very bright future in developing more international universities in Miri as this will not only help the local economy but also Sarawak’s as a whole. 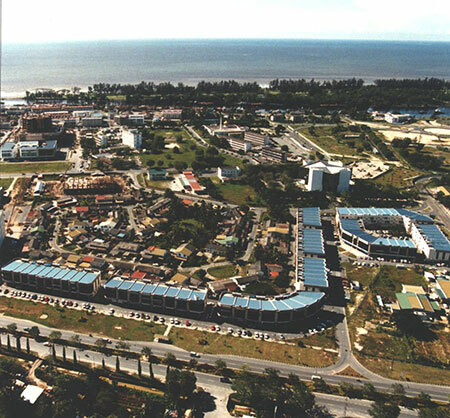 The buildings with blue roofs are shops at Bintang Jaya Commercial Centre, built by Lau who gave each shareholder of Miri Secondary School a three-storey shop in exchange for the site. With the benefit of hindsight, having lived the life you have, would you have done anything differently or pursued everything in exactly the same way? all the time and I don’t pay much attention to my family, especially my wife, and I appreciate her so much for still being with me. Because I spend most of my time doing major development, I overlook so much of family life. I’m extremely lucky to have my wife. However, to achieve something, you have to pay a price and this is the price I’m paying. We are looking into developing a Senadin water theme park resort and when approved, work will start next year. Another project still in the planning stage is the development of 1,232 units of flats at Senadin — from RM250,000 to maximum RM300,000 each. This is in view of the current high price of houses. I’m also getting a few first-tier Chinese universities to have their campus here to further promote Miri as an education hub. Where do you consider yourself a success? Career-wise and academically I am successful. I have three PhDs (business administration, project management and entrepeneurship), two professorships (English and economy) and honorary membership of the Institution of Engineers, Malaysia (IEM). There is no end to learning but to achieve all these, I did not spend as much time as I should have with my family. I regret and feel quite guilty about it. No matter where my wife goes for holidays, I will always WhatsApp her. I feel inspired and recharged whenever I get words of encouragement from her. Two books — How to Win Friends and Influence People and Return to Religion, both by Dale Carnegie. The first book is quite practical and while the second one does not make me believe much in any religion. I believe religions can guide a person on the proper path of life. Many people believe in religion, hoping for divine intervention to solve their problems or bring them benefit. I don’t believe in that. When one is down, nobody seems able to help. At the end of the day, it’s still our inner strength that helps us through our difficulties. Lau flanked by two his longest serving staff. What is your advice to the budding developers? Don’t think about making quick money. They must have the sense of responsibility to uphold the trust of property buyers. You have to make sure the houses you built are worth the money they paid for. Before the interview ended, Lau said the key is to do good by staying true to oneself, and value family and colleagues. Lau makes employees feel part of the family and it is not uncommon for him to be up close and personal when it comes to solving their problems. 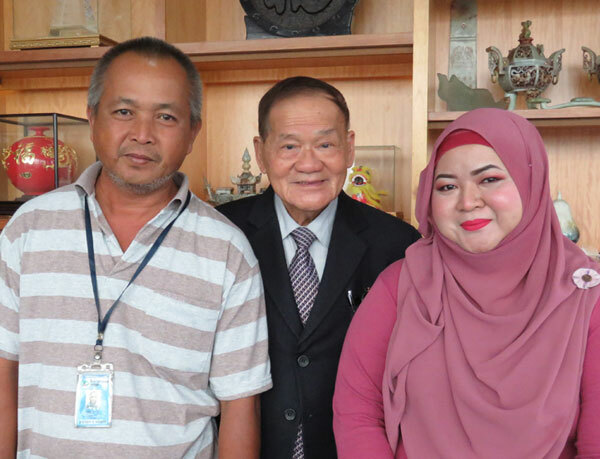 The redoubtable octogenarian said he would stop at nothing to see Miri become a hub for tourism and education, the second largest city in the state and a place to live in peace and harmony. For him, it’s about being fortitudinous in seeing Miri develop as city that embraces diverse cultures, ethnicities as well as wholesome family values, work ethics and modern technology to put Mirians on the right track to greater development and transformation. Lau with one of his longest serving staff Sapawi Hussein and his daughter Shafilla, who is also employed by Lau.